When you get out of the house or travel, you may not want to leave your pet behind. Transporting your dog safely is a top concern. Some dogs can easily fit in the backseat and be secured with a seatbelt. However, when transporting larger dogs, it may be harder to bring them with you. With a car pet barrier you can keep your dog protected and maintained in the back seat or hatch area without having to worry about them jumping over the seats. The following car pet barriers are the best on the market and will allow you to keep your pets safe and secure while you are driving. 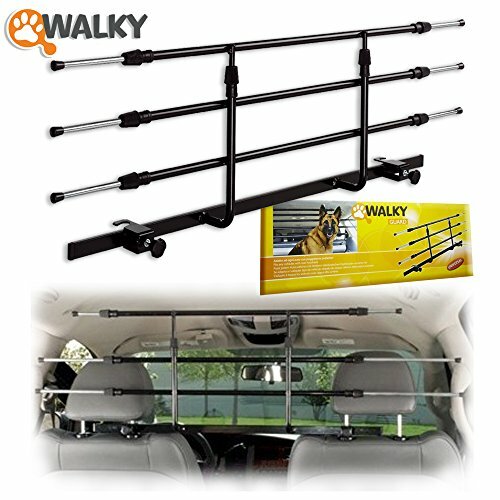 The PetegoWalky Guard Car Barrier for Pet Automotive Safety will keep your dog safely in the backseat without having to worry about your dog or pet jumping into the front seat. You love your dog and keeping your dog safe in a vehicle can be a challenge. 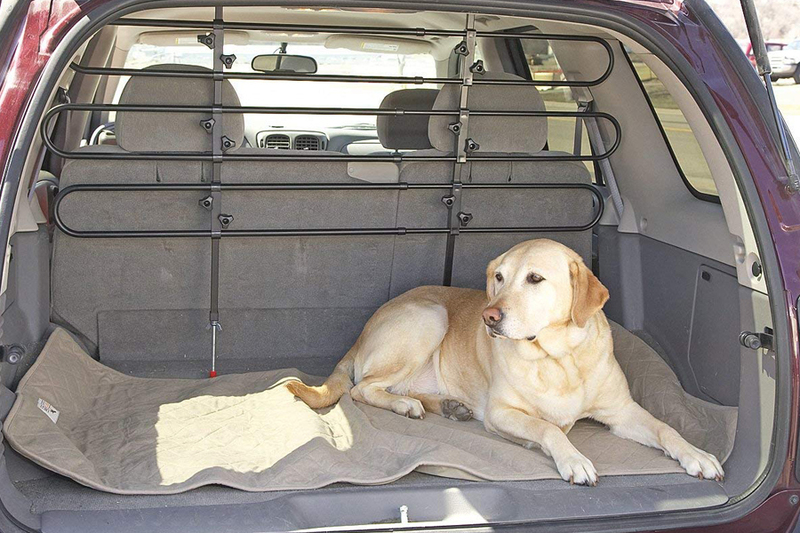 With this car pet barrier you can secure your dog in a comfortable location. This device will fit in almost any vehicle because it is adjustable. The frame of the car pet barrier can be broken down easily allowing you to store the device effortlessly when not in use. The car pet carrier is 54 x 1 x 22 inches in size and weighs only one pound. Because the PetegoWalky Guard Car Barrier is light you will be able to transport the device with ease and move it from car to car. The Guardian Gear Steel/Rubber Vehicle Pet Barrier comes in black. It can adjust completely yet has a frame made of strong steel. The car pet barrier is meant to help keep your dog safely maintained in a specific area within your vehicle. The barriers can be set up in your vehicle within minutes and do not require any tools. 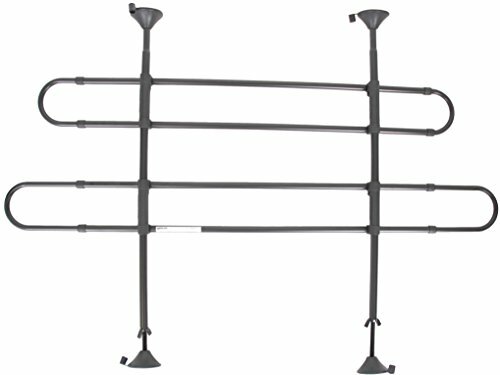 The Guardian Gear Steel/Rubber Vehicle Pet Barrier has caps made of rubber on the ends of the poles. The caps protect your vehicles inside material while securing the barrier. The frame of the car pet barrier can adjust from 35 to 61 inches in width and 26 to 44 inches in height allowing you to place the barrier in almost any vehicle. This device is perfect even if you have multiple pets because cats and smaller pets can get in-between the barriers while maintaining your larger pet in one area. The Highland 20045 Black Universal Pet Barrier will keep your large pet in the area specifically for cargo. By maintaining your pet in the area for cargo, you will be able to drive without worrying about your pet bothering you or other passengers in the vehicle. 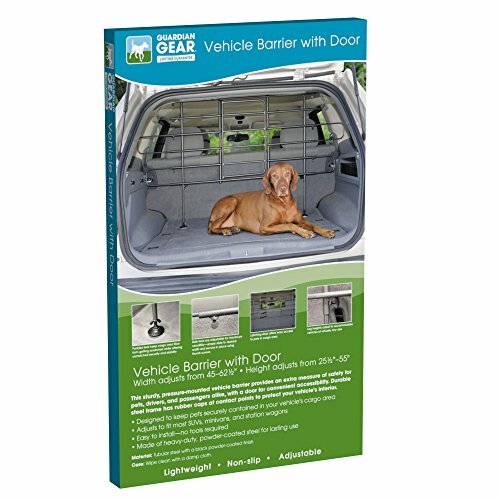 Many barriers look bulky; however, you will find that this car pet barrier is stylish giving your pet a safe area to stay while you are driving. The Highland 20045 Black Universal Pet Barrier has tubing that is made of heavy gauge material allowing the product to be long lasting. You can easily size the barrier into your vehicle because it will transform up to 45 inches tall and 65 inches in width. The car pet barrier is very light allowing you to transport the device from vehicle to vehicle or store the barrier when not in use. When you purchase the Highland 20045 Black Universal Pet Barrier you will have a limited 90 day warranty.